Although the films directed by William Friedkin in the 1970s include some of the decade’s most critically and commercially successful American movies, 1977’s less celebrated Sorcerer stands out as a rare and overlooked gem. Opening a few weeks after Star Wars, Sorcerer arrived out of step with the blockbuster zeitgeist of the late 70s, and was considered to be a major flop for Paramount and Universal, barely recouping $9 million of its $21 million budget. Friedkin’s game-changing ambition, which produced classics like The French Connection and The Exorcist, came to an abrupt end, and the prolific filmmaker descended into obscurity. Sorcerer, however, remains a gripping and adrenaline fueled roller-coaster ride of a film, a remake of Henri Georges-Clouzot’s 1953’s La Salaire de la Peur (The Wages of Fear). The film begins with four different prologues, shot in Vera Cruz, Jerusalem, Paris and Elizabeth, New Jersey. These seemingly disconnected sequences introduce four of Sorcerer’s central, criminal characters and establish each of their dire needs to escape their current situations, which involve acts of terrorism, heists gone astray, bank fraud, and plain ol’ murder. These introductory vignettes are sumptuously filmed and showcase Friedkin’s trademark documentary-style realism as well as his Francophile obsessions. The final sequence introduces Jackie Scanlon, played by The French Connection’s Roy Scheider, who performs admirably in a role that was written with Steve McQueen in mind (who rejected the role because Friedkin wouldn’t give Ali MacGraw an associate producer credit). The movie then abruptly transports us to its main location, a work camp in an unnamed South American locale where all of Sorcerer’s previously introduced characters seek refuge and anonymity. The camp is hell on Earth and the characters perform arduous physical labor employed by an imperious oil corporation. Friedkin excels at capturing the mechanics of the working conditions: smoke, sweat, sparks and iron collide in a visceral embodiment of alchemy. An oil rig explodes, 200 miles from the camp, and the main thrust of the film begins as its main characters are recruited to drive six cases of unturned dynamite through the jungle to blow out the inferno and win their freedom. 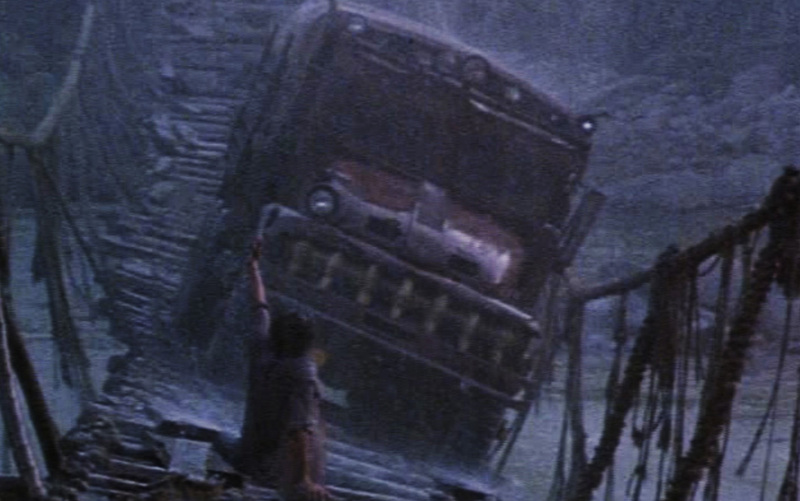 Sorcerer’s lush jungle scenes, which occupy about half of the film, feature breathtaking cinematography and production design, as well as some of finest driving sequences of all time. The drivers encounter an array of elemental obstacles and inner demons, which impede their journey. The high-octane action sequences are punctuated with intimate scenes, allowing actors Bruno Cremer and Amidou to contribute particularly nuanced performances. The 200-mile trek breaks the men down emotionally and physically as they fall victim to hallucinogenic hysteria and insanity. Once the goal is reached, Friedkin successfully leaves us numb and dislocated from the climax, mirroring the exhausted desperation of Sorcerer’s characters. The film ends on an extremely ambiguous note, but remains a satisfying experience, despite its inconsistencies. It has been argued that the hubris of New Hollywood auteurs, Friedkin included, led to the decline of personal art cinema in favor of blockbuster spectacle. Nevertheless, Sorcerer, and certainly The French Connection and The Exorcist, can be seen straddling both sides of this filmic generational shift. All of these films are intelligent and visceral populist sensations, and the self-evident appeal of Sorcerer is tangible nearly forty years after its commercially abysmal release. Friedkin delivers genuine realist thrills without the smoke and mirrors of digital effects, utilizing the kinetic energy of actual physical bodies in motion through time and space. He also manages to balance his impeccable style with an earnestness and honesty unseen in most action-thrillers. Sorcerer demands to be seen, and deserves to be ranked alongside Friedkin’s earlier masterworks. Entrenched in Friedkin’s signature gritty realism, the film can at time be arduous and exhausting, but several moments glimmer with transcendent cinematic magic. Sorcerer is a relentless Euro-styled action-adventure of the highest order, which boasts immense production value and character depth, not to mention a forward sounding electronic score by Tangerine Dream. The film may be more relevant now than it ever was, and it remains one of Friedkin’s most challenging and entertaining films. Sorcerer screens tonight at BAM as part of the series “Friedkin 70s,” which runs through May 7th. Written by: Justin Restivo on May 2, 2013. Last revised by: Double Exposure, our reviewer, on May 3, 2013.